BATHROOM at OLD WORLD DME, INC. STORE HOT ITEMS! 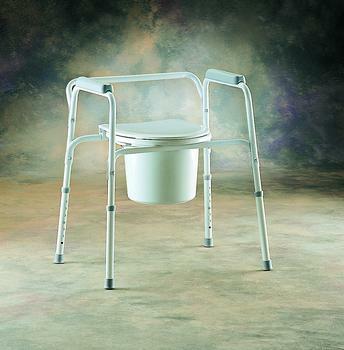 INVACARE CORPORATION All-in-One Commode Versatile model serves as toilet safety frame, raised toilet seat, or stationary commode for use outside the bathroom. Features snap-on seat and lid, splash shield, removable backrest with wing nuts, non-skid rubber tips, and armrests for added comfort. Gray, powder-coated steel. (Also available in chrome by special order.) Height adjusts in 1" increments from 22-3/4" to 28-3/4"H to fit a variety of users. 25"W Base, Overall Height from 23" to 29" and weighs just 12lbs. Weight capacity: 300lbs. Lifetime limited warranty. INVACARE CORPORATION CareGuard Tool-less Shower Chair Shower chair offers stability, comfort, and tool-less assembly in seconds. Aluminum legs with 1/2" snap button adjustments allow height adjustment from 16" to 22". Deep, wide seating surface and ergonomic backrest provide maximum showering comfort. 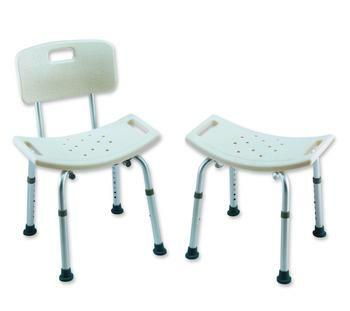 Seat width 21", seat deptyh 12 3/4", with large rubber tips on the legs for additional stability. 315 lbs Weight capacity: Limited lifetime warranty. 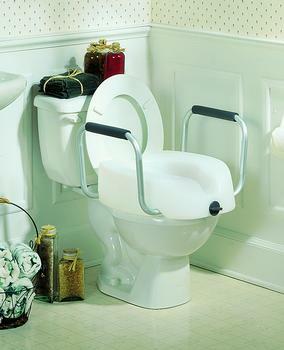 INVACARE SUPPLY GROUP Clamp-on Raised Toilet Seat Attaches easily to most commodes without tools. Clamp-on locking mechanism tightens easily with one hand. Comfortable, contoured seat made of easy-to-clean, durable, molded plastic. Raises existing seat 5-1/2"; allows internal rotation of hips. Non-skid pads prevent seat from slipping. Rear seat wings for more secure attachment. Deep front recess for hygiene. Weight capacity: 250lbs. Lifetime limited warranty.